The peace brokers of the world -- are there any out there anymore? -- missed a great marketing opportunity this year. Here's a rare confluence of calendars that will put Jews and Muslims in a spiritual mode for the same few days. On Tuesday, Jews will head for the synagogue for Rosh Hashanah, and Muslims will gather at the mosque as Ramadan begins. For Muslims it's the beginning of a month of abstaining from bodily pleasures in order to focus on their spiritual side. Time to put prayer and praise of God on the tongue and clear it of lies, accusations and boasts. For Jews it's the New Year and the beginning of 10 "days of awe" leading to Yom Kippur, the "day of atonement." Time to reflect on sins and shortcomings, repent, apologize and get straight with God and neighbors, business associates and family. 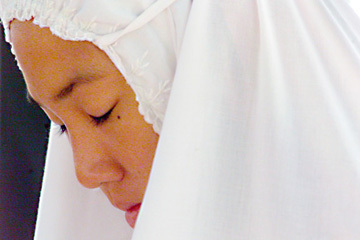 Reyhan Ma bowed her head in prayer during last year's Eid ul Fitr festival in Kapiolani Park, marking the end of the month-long fast of Ramadan. Ramadan is the ninth month of the Islamic calendar. Rosh Hashanah begins the seventh month of the Hebrew calendar. Both are lunar calendars, marking the 28-day cycle of the moon, so they are not in synch with the modern calendar that has a few more days to account for each year as it measures the earth's spin around the sun. Ramadan can and does occur any time of the year because of the shortfall. Next year, it will be 11 days earlier. The Hebrew months drift, too, but they play catch-up every few years, much like leap year in the Gregorian calendar. This year, Jews experienced an extra, leap month, Adar II. In both religions it is a time when even the most worldly and least observant members feel the tug to return to the religious practices that are part of their identity. With God on their minds, wouldn't it be grand if Israelis and Palestinians could find a message in the serendipity of the calendar? My God, your God, same fellow, what's He telling us here? Of course, it hasn't worked without the synchronization of calendars. The 1973 Yom Kippur attack by Egypt and Syria isn't ancient history, and neither are military assaults deliberately done during Ramadan. Don't expect guns to go silent in Iraq for the next month. 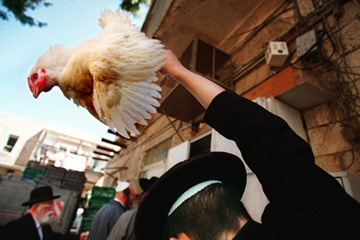 A Jewish man, above, swings a chicken over his head in a ritual performed before the Day of Atonement, Yom Kippur, in Jerusalem. Nobody has commented on the symmetry of the soul seasons, except for a whole subclass of Internet bloggers who speculate that it's a possible parlay into "three R's." Does Ramadan plus Rosh Hashanah add up to Rapture? That's Armageddon-speak for good Christians getting swooped up to heaven while anyone who hasn't embraced Jesus Christ goes to hell. Not so good for those folks celebrating Ramadan and Rosh Hashanah. These bloggers find huge meaning in numbers, counting days between historical events and hurricanes, letters in prominent people's names, warts on red heifers ... whatever. Rather than join that ilk, would it be better to ignore the twining of theological time lines? But Oct. 4 is also on the Christian calendar, the feast of St. Francis of Assisi, a 13th-century monk who led people to find Jesus among the poor and forsaken. He's the author of a prayer that's widely used to this day: "Lord, make me a channel of your peace. Where there is hatred, let me bring love. Where there is injury, let me bring forgiveness. Where there is discord, may I bring harmony." Tuesday seems a significant time to share faith. When the ram's horn is blown at Rosh Hashanah services Tuesday, it will be a call to prayer and introspection for Jews in Hawaii and around the world. According to ancient tradition, the High Holy Days celebrate God's creation of the world 5,766 years ago. The Days of Awe, a 10-day period of prayer, fasting, self-examination and repentance, will continue through Oct. 13 when solemn services will mark Yom Kippur, the Day of Atonement. There are differences in the observance, depending on whether a congregation practices Orthodox, Conservative, Traditional or Reform Judaism, but one ritual they will hold in common is the sounding of the shofar. Blowing the ram's horn during Rosh Hashanah is commanded in the Torah. The Conservative congregation meets at the First Unitarian Church, 2500 Pali Highway. Child care is provided for all services. Call 373-3742 or see www.sofmaarav.org. Monday: 8-10 p.m. A dessert potluck will follow. Oct. 13: 10 a.m.-2 p.m.; 5-7 p.m. A potluck break-the-fast meal will follow. The Orthodox congregation meets at the Ala Moana Hotel, 410 Atkinson Drive, Kona Tower Room 434. Services are open to visitors and local residents at no charge. Community festival meals will follow the Monday and Tuesday evening services. The cost is $40 for adults and $30 for children. Kamaaina rates are available. Reservations are required. Call 735-8161. Reform services are held in the sanctuary at 2550 Pali Highway. Traditional services are in the adjacent Weinberg Learning Center. For information, call 595-7521. Oct. 13: 9 a.m. Traditional service, 9:30 a.m. Reform morning service, 2 p.m. children's service, 3 p.m. Reform afternoon service, 5 p.m. Yizkor and Neilah. A break-the-fast meal will follow. Muslims in Hawaii and the rest of the world will turn away from physical pleasures and focus on their spiritual selves as they begin the month of Ramadan on Tuesday. Adults abstain from food and drink, smoking and sexual relations from dawn to dusk during this month, which marks the revelation of the Quran, the Islamic scriptures, to the prophet Mohammed in the sixth century. Fasting is one of the fundamental religious practices, called Five Pillars, of Islam. The rigorous fast is what captures the imagination of outsiders, but Muslims focus on the positive at this holy time, said Rashid Abdullah, information officer for the Muslim Association of Hawaii. It is a time of extra prayers, charitable giving, reflection and communal meals each evening to break the fast. Members will gather nightly at the Manoa mosque for the "taraweeh," or night prayer, at which a portion of the Quran will be recited. The entire book is completed by the end of the month. While they focus on the words of Allah, Muslims try to refrain from slander, lying, gossip and making false oaths or exhibiting expressions of greed or covetousness. Ramadan begins with the new moon of the ninth month of the Islamic calendar. Despite the scientific fact that the moon phase will begin Monday night, Ramadan does not officially begin until the crescent is sighted without the aid of a telescope. That is why the beginning and end of Ramadan can vary from one country to another. "We do it this way because that was the practice of the prophet," Abdullah said.